The 2014 Australian Open Series kicks off December 28 with the Hyundai Hopman Cup. The series consists of 5 tournaments that span the two weeks leading up to the Australian Open. All 5 venues feature the AO surface of choice, Plexicushion® Prestige. The well known signature Australian Open Series “True Blue” courts are bright and distinctive, helping enhance ball viability for players and spectators. The Plexicushion® System combines the consistent bounce, sure footing, and outstanding durability of Plexipave® with the innovative shock-absorbing properties of EPDM Rubber cushioning. Below we break down the arenas and contenders as we prepare for the first slam of the season! Style of Play – Country based mixed double teams. They compete in one women’s singles match, one men’s singles match, and one mixed doubles match. Defending Champs: Spain. This year they are seeded 8th. Arena: The Perth Arena was completed in 2012. The state of the art facility is configured with a permanent tennis court and retractable roof. 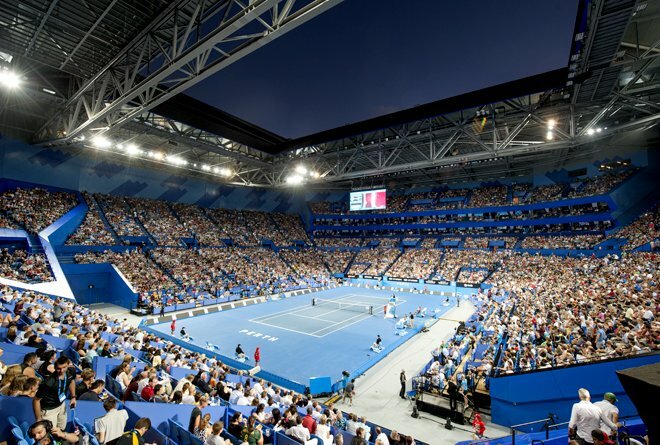 It seats 12,489 for tennis matches and is modeled closely to the Rod Laver Arena in Melbourne. Fun Fact: The 05/06 tournament was the first elite-level event to introduce line call challenges using Hawk-eye technology. Women’s Field: Defending Champ Serena Williams leads the pack while Maria Sharapova plans to make her first tournament appearance since Cincinnati. Also contending is Victoria Azarenka, Jelena Jakovic, and Angelique Kerber. Men’s Field: Defending Champ Andy Murray opts out of Brisbane for Qatar. Roger Federer is the heavy favorite. Also in the field is Kei Nishikori, Tommy Roberdo, and Gilles Simon. Arena: The 23 court complex features one center court and two showcase courts. 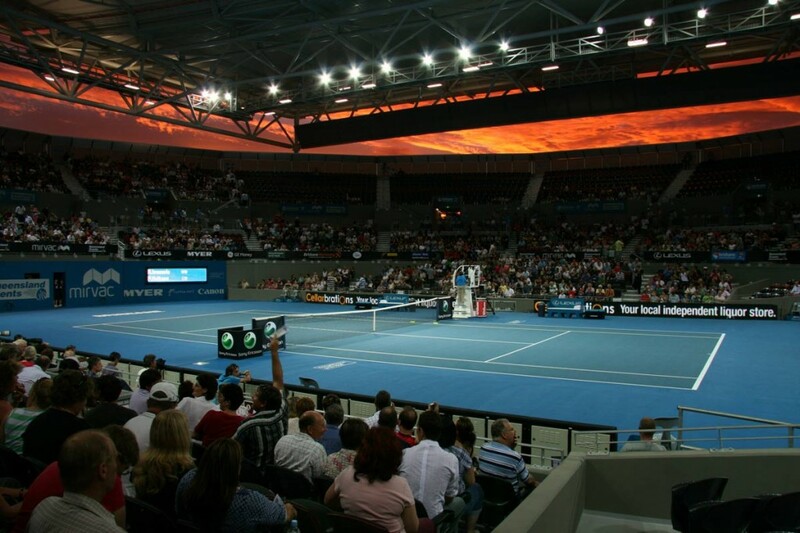 The Center Court, Pat Rafter Arena, is unique in that it is covered by glass fibre fabric roof. The center court seats 7,000 with additional temporary seating. Fun Fact: The Queensland Tennis Centre was the first facility built in Australia to house three Grand Slam surfaces; grass, clay, and cushioned acrylic. Defending Champ: Elena Vesnina returns to fight for back to back titles. Key Players: Sam Stosur leads the pack. Arena: The Domain Tennis Centre features 6 Plexicushion® Prestige courts. In 2011 1800 seats were added to the center court to make room for a total of 2800 spectators. Women’s Field: 10 of the top 20 women will make an appearance in Sydney. 2013 Champ, Aga Radwanska returns to defend her title and leads the pack. The 20 women who have already signed on for the Apia International all fall with the top 35. Men’s Field: Juan Martin del Potro is the only one making an appearance from the top 10. Nicolas Almagros and Fabio Fognini are also competing. Fun Fact: The Apia International is one of the oldest tournaments in the world, having been played since 1885! Style of Play: This exhibition tournament features 4 mixed gender teams of legends players and current stars who compete in singles and doubles matches. Sydney Olympic Park Tennis Centre. Work by Court Craft. The ATP Tour offers a few alternative stops outside the open series. The Qatar ExxonMobil Open will take place the first week of the season and draws in 5 of the top 10 players. Following the Qatar Open is the Heineken Open in Auckland, New Zealand. It brings in a decent field considering many players choose to rest instead of compete in the final week leading up to the slam. Both tournaments will be played on Plexicushion® in preparation for the Australian Open. 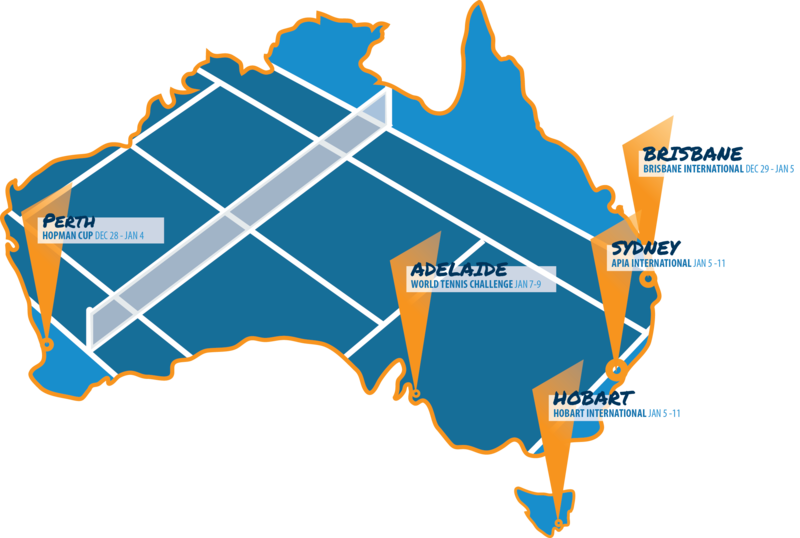 On the WTA tour, most of the action resides in Australia. The best crop of players can be seen in Brisbane the first week and Sydney during the second. To learn more about the Australian Open Series visit their website at www.tennis.com.au. You can also learn more about Plexicushion® Prestige, the surface of the Australian Open and AO Series, here. This entry was posted in California Sports Surfaces, Plexipave® and tagged Australian Open, Australian Open Series, Plexicushion, Plexicushion Prestige, PlexiPave.